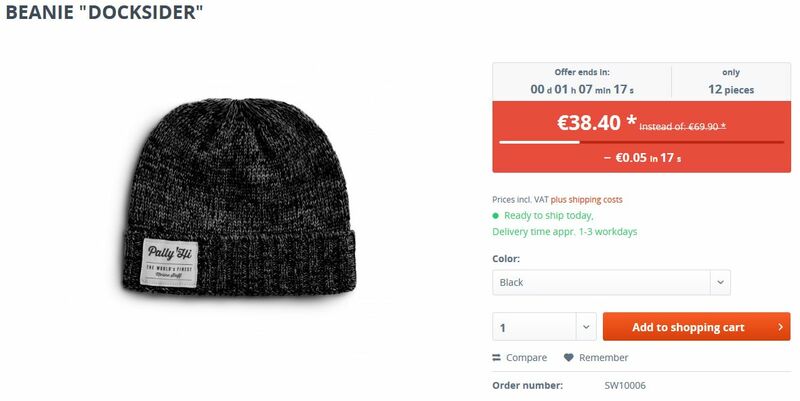 Why did the Live Shopping discount will not appear in the frontend? The Live Shopping Plugin allows you to offer items over a defined period of time or a defined amount with a promotional price. Discount per minute: The price will be decreased every minute. Surcharge per minute: The price will be raised every minute. The plugin had to be installed like any other plugin via the Plugin Manager. The cache had to be emptied after installation / activation. Show article ranking (1): When setting Show article rating to yes, the article ratings are displayed in the listing as well as in the / live shopping listing. 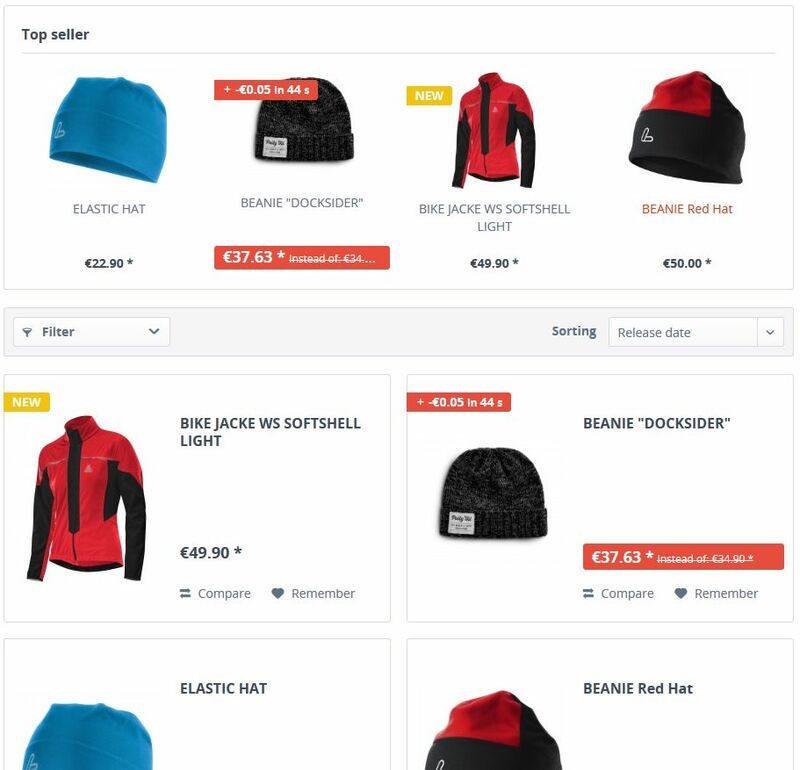 Template selection (4): The option Template Selection, offers you the possibility to change the number of columns displayed in the Live Shopping listing. Show Live Shopping filter in listing (10): If set to yes a new filter called "Live Shoopping" is available in the filter options of the catgories. Open the article and click the tab Live Shopping (1). Use the Add Live Shopping (2) button to create a new Live Shopping action. To remove Live Shopping actions, simply select the appropriate Live Shopping actions and remove them by using the button Delete Live Shopping (3). 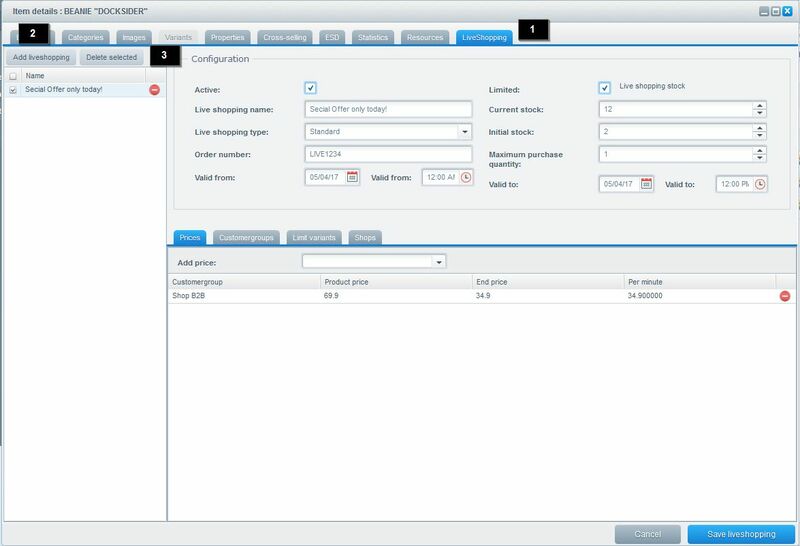 After you created a Live Shopping action, the configuration window becomes visible. Until then you are able to define your Live Shopping settings for the selected action. Live Shopping Name (1): Internal name for the action. Live Shopping Type (2): Determines whether the item is sold in standard as discount per minute or surcharge per minute. Order number (3): Specifies the order number for the action. Valid from von (4): Sets the date and time when the action starts. The start date or time must be before the end date or time- Otherwise the date cannot be set. Limited (6): Determines whether the number of action items is limited or not. 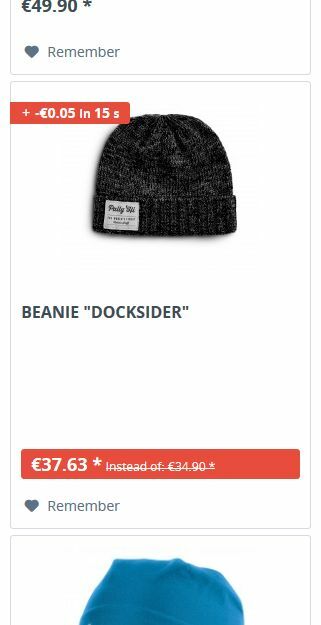 If the number is limited, the exact number of items available for the Live Shopping price appears as a purchase incentive in the frontend. Current stock (7): Sets the stock when limiting. Initial stock (8): Sets the initial stock level. This option as like a pseudo stand. This value is crucial for the scale of the limitation. Maximum purchase quantity(9): Sets the maximum number of items that can be sold at once. Valid to (10): Sets the time and date at which the action is terminated. The end date or time may not be before the start date or time. Otherwise the date cannot be set. After you have configured your Live Shopping action, click the button Save Live Shopping button before setting further options. Prices (1): Specifies prices specific to each customer groups. 'Product price' is always the initial price and 'End price' sets the final price or in standard mode the action price. 'Per minute' will show you the price difference per minute. Customer groups (1): Defines for which customer groups the action is visible. Shops: Defines the (sub) shops where the action will be visible. After the settings the Live Shopping you have to save the article once more. Other the changes will not be accepted. 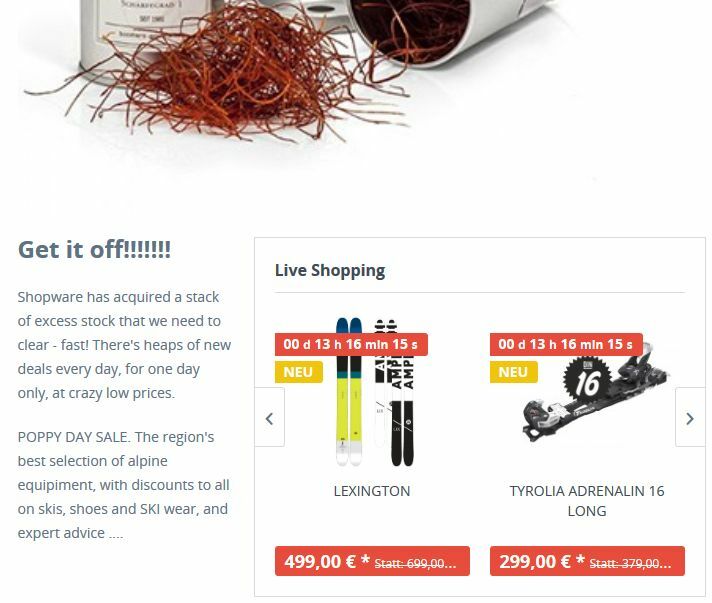 The plugin offers 3 different modes for live shopping in total. The discount is offered for a limited time period. The article price will be given out in the frontend as a bar price (instead of :). The final price is the promotional price. In this module you can neglect the column 'per minute' as this has no meaning here! The article will be getting cheaper every minute during the given period. The article price is your starting price, the final price defines the price of the last minute of the promotion and the column "Per minute" shows the amount of the article discount which is getting cheaper each minute. This is the exact opposite to the discount per minute. 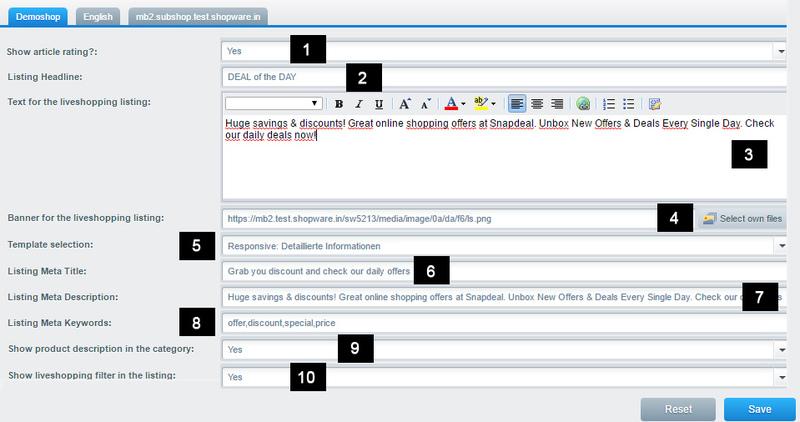 Live Shopping articles are specially marked in the frontend in the listing and on the item detail page. Create a php file 'time.php' with the following content and upload it to your server. Afterwards call the php script with http://www.meinedomain.de/zeit.php. The current server time will be displayed. If there are many live-shopping items in your shop, this results in a large number of assignments in the database. You should make sure that the limit in your database is sufficient. If it is not, this can be increased by your hoster. You can test and purchase the plugin directly from our Store , the official market place for all Shopware extensions.